PatentlyApple is reporting on a new Apple patent has surfaced showing describing an iPhone with a “smart bezel” which could have indicators to guide user’s through the use of the device. The reason for this would be to provide instruction, without taking up screen space, which is lacking on device such as an iPhone. 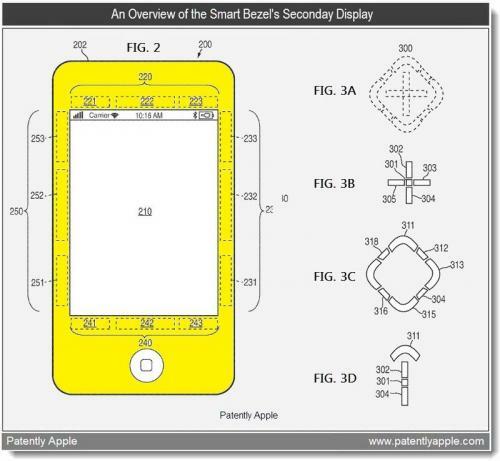 Apple’s patent covers systems and methods for selectively illuminating a secondary display. An electronic device could include a primary display (e.g., a liquid crystal display (LCD) screen) and a secondary display (e.g., a printed segmented electroluminescence display). The primary display could be used to convey visual content to a user, and the secondary display could be used to guide a user providing inputs to the device. For example, the secondary display could be selectively illuminated to provide one or more indicators that represent where or how a user can provide inputs to the device. Developers could “draw” different icons in the bezel, such as a gamepad icon, a “+” and so on. This is interesting, and would most certainly be unique, but to me it undercuts Apple’s insistence on simplicity. Perhaps they could pull it off, but the more buttons you add to something, the more complicated it gets, for developers and to end-users.